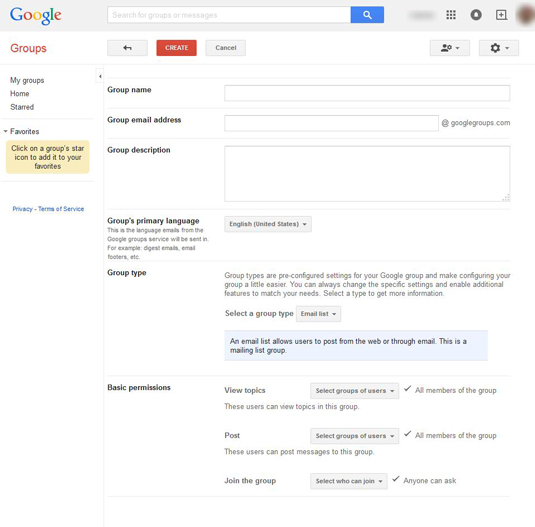 You can create a Google group for any reason — it doesn’t matter if it’s for personal or business reasons. You can set up a Google group to discuss how to care for your favorite plant or as a place to discuss an ongoing project. The object is to provide people with similar interests a place to discuss them. Depending on your topic, though, you may want to include some restrictions on who can join the group. Click the Create Group button near the top. Type in the Group name. You see that the Group e-mail address fills in automatically. Your group name needs to be unique; if it’s not, Google tells you that the name is already taken. Type in a Group description. It can be only 300 characters long, so make it short! Change the Group’s primary language if it’s different from the default. Email list: This option is a typical mailing list, which enables users to post through the Web or through e-mail. Web forum: This option is a typical discussion forum, in which users interact through the Web only. Q&A forum: This option is also a discussion forum, but with extra features that allow for asking and answering questions. Collaboration inbox: This option is good for when you have to track tasks and assign them to other members of the group to do. View topics: The default is that the group owner, manager, and all members can view topics, but not the general public. If you want anyone and everyone to be able to view your topics, choose Public from the drop-down. Post: Again, the group owner, manager, and all members can post by default. If you want open posting from anyone in the universe, then enable Public from the drop-down menu. Join the group: Anyone Can Ask is the default, which means that your group will be listed and will show up in search, but it’s closed to viewing and posting. People can ask to join your group, which is fine if you’re setting up a group on a general interest topic and you want to meet others sharing the same interests. The same goes for the Public option; the only difference is that people don’t have to ask to join. If you’re setting up a group for business reasons, you likely want to choose Only Invited Members to keep the group closed and not have just anyone asking to join. When you’re finished with the basic setup, click the Create button at the top. Google Groups requires you to prove you’re not a robot by typing in the Captcha. Do so and click Continue. You see a dialogue box that says that your group has been created. The box lists a few helpful things you can do next, such as invite people, customize the group’s settings, and add a topic. You can click to do these things, or click the Okay button to venture out on your own. 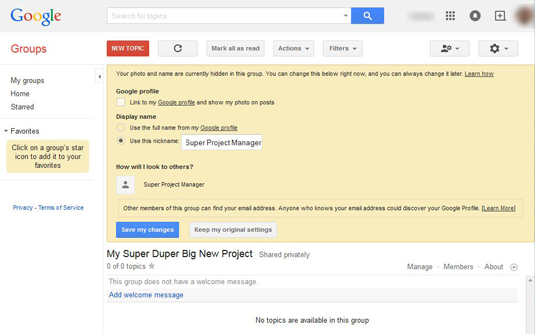 Figure 1: Set up a new Google group. Google profile: Check this box if you want others in the group to see all of your shared information, such as pictures, profile information, and so on, in your Google profile. You probably don’t want to enable this. Display name: Your real name from your Google profile displays by default, but if you don’t want to display your real name, you can specify a nickname. You can see how you will look to others (with or without a picture and with your real name or a nickname). Click Save My Changes to wrap this up. Figure 2: Decide how you appear to others in the group.